Drug-resistant infection in humans and animals is causing increasing public concern. Microbes adapt to create “superbugs” when repeatedly exposed to antimicrobial medicines, particularly bacteria when exposed to antibiotics. Weak bacteria are killed and resistant bacteria thrive and multiply. The Chief Medical Officer for England, Professor Dame Sally Davies, places this “ticking time-bomb” on the level of the threat from terrorism and pandemic flu. Convinced that antibiotic medications are not viable long-term, University of Wisconsin-Madison Department of Animal Science Professor Mark Cook has been researching an alternative treatment since 2011. “You really can’t control the bugs forever; they will always evolve a way to defeat your drugs,” Cook says in a University news release. Instead, his work has focused on how pathogens, including bacteria, shut down the body’s immune response by producing a chemical that manipulates the protein Interleukin 10 (IL-10), an anti-inflammatory cytokine. Although manipulating the immune system is not a new technique, Cook’s research is the first to look at altering IL-10 in the intestines. Cook, and animal science associate researcher Jordan Sand, successfully disabled IL-10 in the intestines, allowing the animal’s anti-inflammatory response to fight the intestinal disease coccidiosis that they had previously been susceptible to. In this study, hens were vaccinated to produce antibodies to IL-10. Their eggs carrying the antibody were then sprayed over feed given to other chickens, a more commercially viable method to protect large numbers of birds than vaccination. In experiments on 300,000 chickens, those fed the antibody were found to be protected against coccidiosis. Coccidiosis can be fatal, especially in young chickens. Birds are infected by oocysts in bird droppings with painful symptoms including diarrhoea and weight loss, as well as internal bleeding. One bird can infect an entire flock in overcrowded and dirty conditions. Results from IL-10 intervention have also been promising in initial low volume tests on beef steers. University of Wisconsin-Madison Professor Dan Schaefer and graduate research assistant Mitch Schaefer fed steers the IL-10 antibody for 14 days and during this period, the rate of bovine respiratory disease was halved. 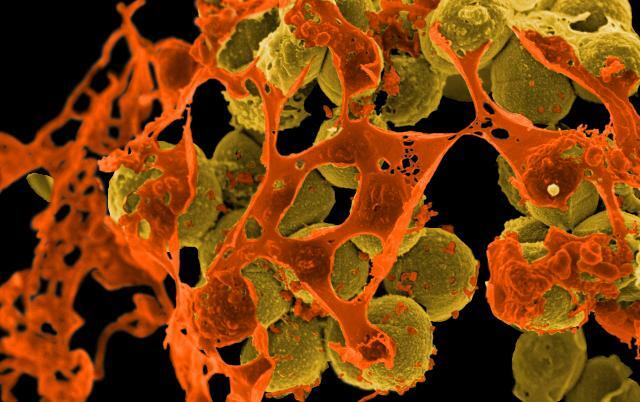 In her address to Oxford University’s Oxford Martin School, Professor Dame Sally Davies warned of the global threat to human health of infections that can no longer be treated with antibiotics. Resistance can spread from animals to humans through the food chain or by direct contact. Jordan Sand notes that people working in conventional chicken farms are much more likely to carry multidrug-resistant pathogens than workers in antibiotic-free farms. Davies, who advises the UK government, points to the overuse of antibiotics in medicine, as well as agriculture, as contributory factors to resistance. In UK health systems for example, doctors over-prescribe antibiotics. In U.S. intensive farming systems, animals are routinely given antibiotics to control disease and promote growth. The U.S. Centers for Disease Control and Prevention (CDC) has reported that 80 percent of all antibiotics sold in the U.S. are given to poultry and livestock. Davies has warned of a future that takes us back to pre-penicillin times where patients die on the operating table from minor infections that cannot be treated. In 2013, the European Center for Disease Prevention and Control estimated that 25,000 deaths per year in Europe are attributable to antimicrobial medicine resistance. In UK hospitals, around 5,000 people die each year from resistant E-coli, and outbreaks of meticillin-resistant Staphylococcus aureus (MRSA) show how quickly antibiotic-resistant infection can spread through human contact. The CDC estimates that in the United States at least 23,000 people die each year as a result of antibiotic-resistant infections.The global economic impact is significant with increased costs of treatment, and reduced productivity due to sickness and death. Worldwide co-operation is crucial to tackle the issue. At the 68th World Health Assembly in May, the World Health Organisation presented their Global Action Plan on Antimicrobial Resistance as a framework for member states to develop their national plan by 2017 to cover antimicrobial medicines in animal health and agriculture, as well as human health. German Chancellor Angela Merkel has placed antimicrobial resistance on the G7 Summit agenda and Germany already has a national plan, DART 2020. Likewise, the UK Department of Health has published its UK 5 Year Antimicrobial Resistance Strategy. In the U.S., the government will hold a forum next week where 150 representatives from businesses and organisations involved in animal and human health will discuss limiting antibiotic use. Dame Sally Davies is calling for global regulation and restriction of antibiotics, within health systems and in countries where antibiotics are available over the counter; for research into new antibiotics and alternative treatments; and for improved hygiene in farming and meat processing systems to prevent animal waste contaminating meat and crops. Because antibiotics are not broken down, but excreted, faeces and urine can contaminate water sources such as streams, rivers, lakes, coastal waters, and water treatment plants. Pathogens can develop resistance to antibiotics in water, as well as within the animal or human body. The solution then is complex, involving global co-operation of pharmaceutical, healthcare, farming, food production, and water industries, as well as public education on hygiene and disease prevention. The need for antibiotic control and alternative treatments has never been more pressing. The commercial product that will be developed from Cook and Sand’s research will start to address this need.